You know, a list of those things you want to complete before you die (or, kick the bucket)? The idea is that you perform these tasks in order to get the most out of life. This list inspires us. It motivates us. It encourages us to try new things. It keeps us moving forward; evolving and possibly, without us even knowing, makes us better. Goals do that. Anything that we write down, make measurable and holds us accountable generally has a better chance of getting done. Humans are funny that way. As market conditions change, businesses – and business owners – must adapt. Often, it’s necessary for those involved in business marketing to refocus and reignite their promotional efforts. But the day-to-day rigors often keep us stagnant. We are creatures of habit, and often stuck in the status quo. And our colleagues, not to mention spouses, won’t let us go ride a bull for inspiration. 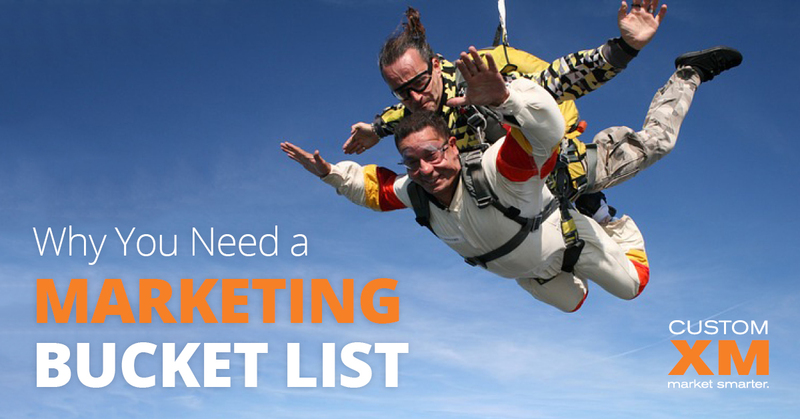 So here’s an idea – create a Marketing Bucket list. We’ve prepared our own Marketing Bucket List for you – Download it here. But I know you’re busy. You are trying to decide if it should be Mt. Everest or Kilaminjaro as Bucket List Item #7. I get that. We’re here to help.